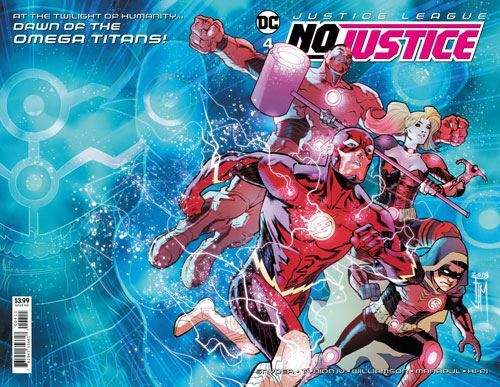 No Justice comes to its end with issue 4, although it’s really not a conclusion to the story. It wasn’t intended to be. The miniseries was meant to introduce the new Justice League books, and it does precisely that. The broken Source Wall remains a cause of concern, and even though the heroes figure out a way to stop the four Trees from destroying the Earth, they remain in place in a dormant state. I wouldn’t have minded this going on for another issue or so. An awful lot happens in a very compressed amount of page time, and some of the plot elements are not really given enough play. Alternately, there could have been more tie-in issue. The subplot with Amanda Waller and Green Arrow was expanded in the pages of the Green Arrow annual very successfully, and a few more one shots could have helped balance out the catastrophic events taking place throughout the cosmos. I was extremely pleased with the way Vril Dox has been used. I guess I need to start calling him Brainiac 2 now. His return in some DC book is pretty much a certainty. And I also found myself looking forward to the new incarnations of the Justice League. The main title will have essentially the classic line up, while a new version of Justice League Dark is in the offing. Frankly, anything with Detective Chimp is worth picking up, in my eyes. Justice League Odyssey looks to be a cosmic slant for the team, which is a new direction for the League. Manapul’s art has been top notch in every issue, and the finale is no exception. He has handled the large cast very well, and a wide variety of locations and moods on top of that. In brief, I found No Justice to be everything I wanted it to be.